In an effort to ensure that people are svelte enough to fit into their Logan’s Run jumpsuits, some companies are encouraging employees to track their health habits, including how much they exercise, what they eat, and, creepiest of all, how much sleep they get when they’re not busy becoming part of the company’s hive mind. According to Wired, one company in particular has taken the trend of personal data tracking to the sort of invasive levels science fiction writers once dreamed of. Citizen, a Portland, Ore. company that designs mobile technology, has its employees (voluntarily, of course!) uploading data on all kinds of things they do outside of work, like exercising, eating, and sleeping. The goal is to show employees how they can become even more productive servants of the Great Life-Giving Corporate Entity simply by improving their personal habits, with the gerund “improving” of course meaning exercising with the regularity of someone training to be a contestant on American Gladiators and eating like a frightened Homo erectus being chased by lions. Citizen’s data-tracking program, true to its inherent nagging tendencies, is called “C3PO,” and constitutes one of the latest (and scariest) developments in the “quantified self” movement started by Wired’s Gary Wolf and Kevin Kelly. What is “quantified self,” you ask, glancing timorously out of your window to see if the Grammaton Clerics are coming to burn your vinyls and kill your new goldendoodle puppy? It’s exactly what it sounds like: a (typically) personal undertaking to discover more about your general well-being through statistics. Will you be less productive at your job if you tamp down five buttermilk pancakes with bacon syrup every morning in the five minutes between waking up and leaving for work? 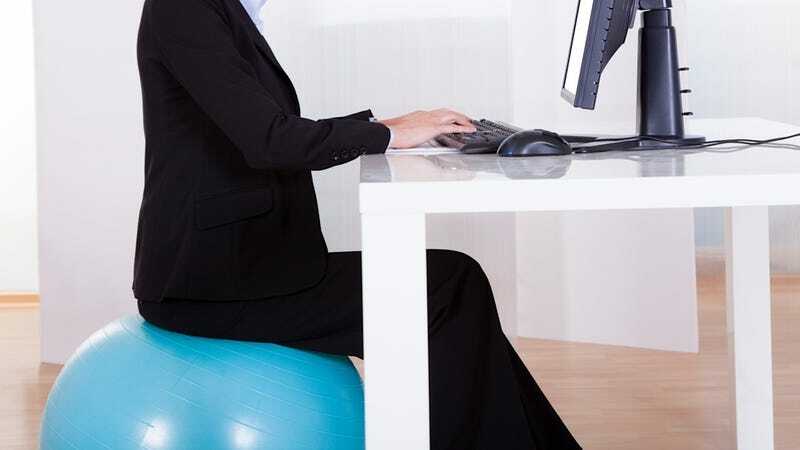 Will you be more productive if you do several vigorous squat-thrusts within your cubicle? C3PO taps into a service calls Health Graph — which collects data from personal activity trackers such as Fitbit and RunKeeper — but it also collects data from various software tools used inside the company, including the project management system TeamWork PM, the time tracking application RescueTime, the audio system Sonos, and the employee mood tracking service Happiily. In the future, its designers hope the system can provide all sorts of insight into employee behavior, such as whether listening to particular types of music increases productivity, or whether employees who have entered a new relationship are less productive than those who are single. Simpson says they even plan to post employee health stats to Citizen’s website. Right now, C3PO is just a voluntary program in a trial period, and many employees at Citizen are waving their privacy rights while the company figures out how to use the information gathered from the system. Finley is quick to note, however, that as more companies jump on the quantified self bandwagon, more privacy issues are going to crop up, the biggest concern being that companies will use data gathered on individual employees to make human resources decisions. Follow that menacing thought to its natural conclusion and the bleak, dystopian future becomes quite clear: a world without the life-affirming office doughnut party, a world in which the line between work and binging out on Netflix original programming for two straight days has been obliterated.